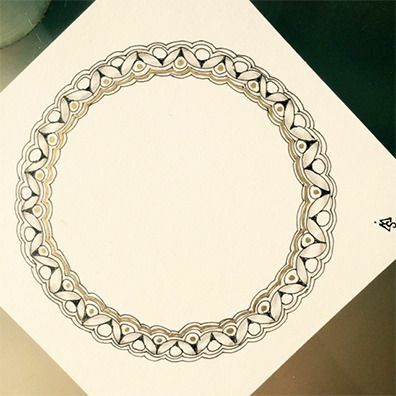 To best share the Zentangle Method and Artform with others, we invite you to become a Certified Zentangle Teacher . . . a CZT. We have scheduled four training seminars for 2016 and registration is now open. All seminars begin on Sunday evening and end late afternoon on Wednesday. Each seminar link will take you to its respective registration page on our website. There you can choose whether you wish to be a day student, share a room with another student or have a private room. Please note that each user can only register once for each seminar. When you register online, you will only pay a non-refundable registration fee of $150. The balance will be invoiced in a follow-up email. Payment plans are available on request. To learn more about seminar and becoming a CZT, click here. If you have any questions, please email Martha. If you are planning to attend, please register right away. These seminars tend to fill quickly. A quick hello from Amsterdam. My family is on holiday and I have the house to myself. I really enjoyed playing with zenith* . . . fabulous tangle. 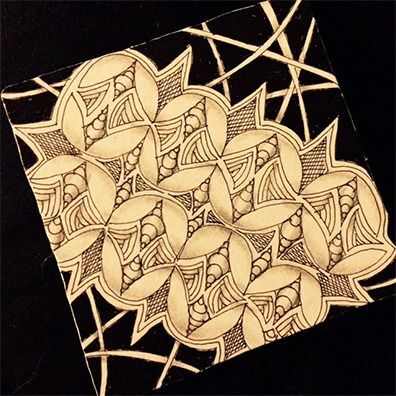 I am so grateful for Zentangle! And your wonderful guidance in sharing this drawing method. I attended the 20th CZT seminar and have a workshop scheduled for this coming Sunday. This is my display to share (my tiles from the seminar) with my tai chi students, friends and tanglers. PS: I bought the multi-picture frame at a rummage sale, but it will allow anyone to take the tile, turn it, and replace it without it being only one orientation. I have had fun just arranging the tiles. hello rick and maria...and the wonderful staff at zentangle! THANK YOU SO MUCH for the latest newsletter which highlights, last but not the least, the czt 21 seminar, of which i was part of. i will cherish this one-of-kind experience i was so lucky to be immersed in. i am so grateful to everyone at zentangle for your care and dedication!!! wishing all of you the very best in life. I just wanted to express my gratitude for the wonderful seminar I attended in June. I was at Seminar 21 and thoroughly enjoyed the entire session. I have taken many classes and attended countless of seminars but never one as pleasant and organized as this one. Your entire team is to be commended on how smoothly the sessions flowed. I thank-you and am grateful for the opportunity to attend such an inspiring event. I hope to attend another one in the future. I recently became a CZT at Seminar #21 and I am still feeling euphoric about the entire experience. Before leaving Rhode Island to drive back home to Toronto, my daughter and I decided to do some last minute shopping at a Target store in Warwick where I found this adorable bisque bear standing all by himself. When I brought him home, I was inspired to cover him with examples of my love for Zentangle using some of the patterns you taught us. My daughter thought he looked a little sad so I added colour with the two Sakura Koi Brush pens that I found in my cloth bag. The pens are fabulous and I have ordered a set of 12 to use in place of regular watercolour paints. Thank you so much for your inspiration, knowledge, and generosity during the seminar. 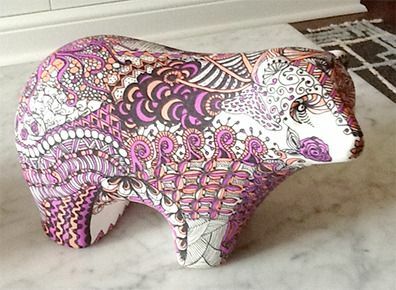 This little bear will always remind me of my Zentangle experience. Army veteran Charlotte Carpentier poses with examples of Zentangle, a meditative drawing art form. 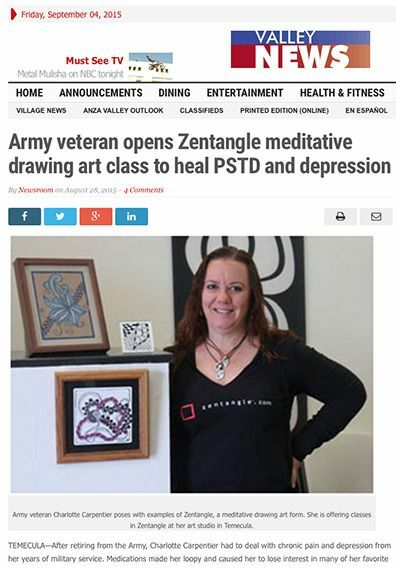 She is offering classes in Zentangle at her art studio in Temecula. TEMECULA - After retiring from the Army, Charlotte Carpentier had to deal with chronic pain and depression from her years of military service. Medications made her loopy and caused her to lose interest in many of her favorite forms of art, but she discovered a new form of therapeutic meditation that changed all that. "I was looking at books on Amazon and I found a book on Zentangle. After reading the description, I ordered it. I gathered all the materials, drew my first tile and I have been hooked ever since," Carpentier said. * Tangle instructions for zenith are in this newsletter. 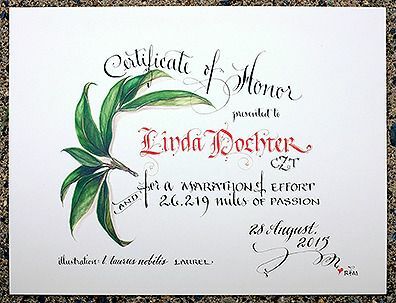 Enjoy an emotional and heartwarming story of one CZT's "marathon" on this blog post. We extend a warm welcome to all the many people who have signed up recently for our newsletters. We are honored and grateful that you have invited us into your inboxes. You can see all our earlier newsletters at this archive link. They are full of wonderful stories, beautiful Zentangle art and many tangle instructions. To all who will be attending CZT seminars in 2016, we look forward to meeting you and working with you!